30% Off Selected Easter Items at Emma Bridgewater! Emma Bridgewater started life in 1985 when founder Emma couldn’t find a cup and saucer that was just right for her mother. Emma wanted to find her mum the perfect birthday present, but found the market full of cups and saucers that were either too formal or too cumbersome. Emma realised there was a gap in the market for pottery that was both practical and colourful, pottery that embodied the wonderful idiosyncrasies of everyday British life. Over thirty years later and this mission statement still informs and inspire everything Emma Bridgewater do. Their designs take inspiration from the little things, their ‘Marmalade’ range coming from a tradition of stockpiling the family larder with delicious home-made marmalade every February. On top of this, though, Emma Bridgewater want to help add to these lovely little moments. Whether it’s a comforting cup of chamomile tea in your favourite colourful cup, or a family feast where the crockery is as much a feature as the food itself. Each item is meticulously designed to be totally practical as well, from pasta bowls big enough for your generous portions, to mugs that fit your hand like a glove. When your Emma Bridgewater order arrives, it truly feels like home. How do I use my Emma Bridgewater discount code? If no code necessary, your discount is included in the final price! Become a VIP by joining Emma Bridgewater’s Collector’s Club. You’ll get priority access to sales, offers and even exclusive Collector’s Club items, and invitations to factory open days. Can I specify a delivery time for my Emma Bridgewater order? 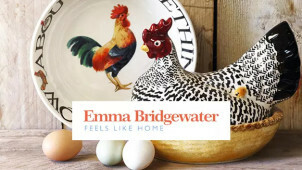 Emma Bridgewater offer next day delivery for UK mainland orders, but do not currently allow customers to choose a specific delivery time slot. Do Emma Bridgewater offer a refer-a-friend scheme? If you think a friend will love Emma Bridgewater as much as you do, use their refer-a-friend service and they’ll offer your friend an introductory discount, and there’ll even be a little something in it for you. What is the difference between a ‘first’ and a ‘second’ with Emma Bridgewater? As all their items are handmade, some may contain small faults. These may be in the shape, the finish or the decoration, but the piece will still work just fine. The fault will be marked with a black or red mark, so you know where it is, but this will wash off no worries. Are Emma Bridgewater items dishwasher-safe? All Emma Bridgewater pottery can go through your dishwasher with no problem, but they suggest using a lower temperature setting and liquid washing detergent so as not to damage the pristine appearance of the product in any way. International delivery charges vary, see here for details. If your pottery arrives with you a little worse for wear, get in touch with Emma Bridgewater within 28 days and they can send you a label so you can return the item free of charge for a full refund or a replacement. If you simply change your mind, you can still get a full refund within 28 days, however Emma Bridgewater won’t offer a free returns postage label. Personalised items can only be returned if faulty. With over 30 years of experience, and hundreds of wonderful handmade items on offer, Emma Bridgwater has established itself as one of the leading names in British pottery. They create items that are both beautiful and practical. Transform your kitchen with an Emma Bridgewater discount code, and discover a whole world of earthenware delights. With all their lovely designs created personally by founder Emma and her husband Matthew, Emma Bridgewater embrace the colourful eccentricities of British life. Emma Bridgewater pride themselves on being a distinctly British company, with all their pottery being made in Stoke-on-Trent, the traditional home of pottery in the UK. One of the biggest employers of potters in the area, Emma Bridgewater embody all the quirks, charm and craftsmanship you’d expect from a British ceramics company. Stoke, known affectionately as The Potteries, is officially recognised as World Capital of Ceramics, so it’s easy to see why Emma Bridgewater would want to base themselves here. Why not make your order that little bit more special with a personalised name or message? With a huge range of options across their iconic range of mugs, bowls, plates and teapots, an Emma Bridgewater promo code can help you personalise your pottery without breaking the bank. The perfect present for birthdays, anniversaries, house warmings or ‘just because’, make their eyes light up with a one-of-a-kind gift from Emma Bridgewater.